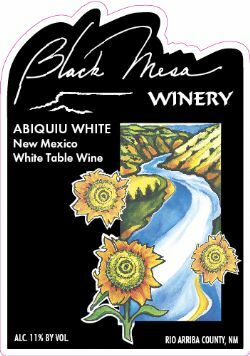 The grapes for Black Mesa's Abiquiu White are grown in Stan Bader's vineyard in Abiquiu, New Mexico and along the Rio Chama. An off-dry white wine, with floral and citrus flavors and a touch of spice. A medium-long finish whose many subtle flavors surprise and delight your palate. A perfect way to end a northern New Mexico day.